One family, the Abbo Family, can trace its lineage back over five successive generations in Safed. Understanding their history, and following their family story is one interesting way to understand and explore the history of Safed. Anyone who knows Safed history knows about the Abbo family tradition on Lag B'Omer. The house that they still use today for their celebration was the one that was built at the start of the 19th century in Safed. Generations ago, they started the custom of bringing forth the Abbo family Torah scroll with a great deal of pomp and ceremony. 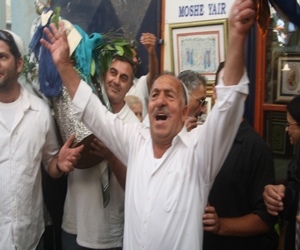 On Lag B'Omer, the Abbo house becomes the center of the festivities in Safed and is a testament to the Abbo family's resilience in the face of so many years of obstacles. A few years after arriving in Israel at the beginning of the 19th century, Rabbi Shmuel Abbo purchased the site of Rabbi Shimon bar Yochai's grave in Meron and then built the synagogue that is still in use there today. He also bought approximately 1800 acres of agricultural land in Meron Village and encouraged Kurdish Jews to settle there. They divided their time between the land and their study of Torah. Their presence in Safed, and their desire to work the land, predated the Zionist pioneering spirit and settlements by quite a bit. Their activity and their commitment was quite a surprise to the local Arabs. The Safed community gave Rabbi Abbo a Torah scroll with his name in order to honor him on the eve of Lag B'Omer in 1833. They carried the scroll from the Abbo home in Safed to the Bar Yochai synagogue in Meron, thus beginning a tradition that is still performed each year on Lag B'Omer. Soon after this tradition began, the original scroll was replaced with a scroll decorated in silver and gold and donated by the rabbi and consul Yitzhak Mordechai. This is the scroll that is still paraded on Lag B'Omer to this day! For five generations, this family has been preserving the tradition and passing the Torah from father to son on Lag B'Omer. Lag B'Omer is certainly an interesting time to be in Safed, and an amazing time to witness the Abbo family in action. If ever there is a time to see a Jewish tradition grounded in the land of Israel and in the city of Safed, it is the Abbo family on Lag B'Omer!